If you’ve been following this story previously, you might be aware just how far we’ve got with our research of the message in a bottle. From finding out more behind the story of how Silver Bay residents, the Harringtons discovered the message in a bottle. Featuring on the BBC website as well as numerous front pages in the China Press – to say the story has gotten quite big is a huge understatement! Take a look below to discover all the latest update and interviews. Since posting our story, the amount of email response we’ve had has been impressive. We’ve been contacted by everyone from Xiamen University students through to a journalist at the BBC – and they all want to know the same thing; Where did this message come from? 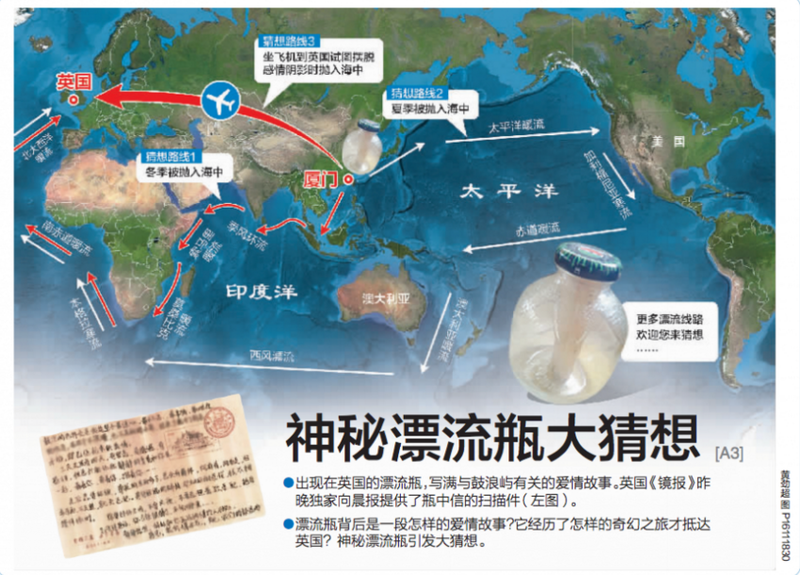 Although we’re no closer to learning the truth, we’ve discovered more about the origins of the bottle and also more about Gulangyu Island, which is referenced to in the post itself. We recently received an email from a lady who is originally from Xiamen but is currently living in the UK. Needless to say, she felt compelled to write after the reading the story and informed us of a few key things. She told us that Gulangyu Island itself doesn’t have any cars on it. In fact, all they have is one fire engine! She also told us that you can walk around the entirety of the island in 3-4 hours, and that 90% of homes have pianos in them. On top of this, Ellen claimed it’s a top date place for young people to visit, as it is very beautiful and romantic. As well as all providing all this amazing information, she also volunteered a possible background story, which we are inclined to believe ourselves. Ellen believes the message tells a story of two students choosing between following their love for one another and following their dreams. She also suggested it could be pressure from their family to follow their careers. As they seem to be saying goodbye, we can only assume their dreams and career aspirations won over their love, if this is the case. 1. Did you imagine getting a response from China? 2. Did you know Xiamen or Gulangyu islet before this? 3. Are you interested in Chinese culture? 4. What do you think about the contents of the message? 5. Could you introduce yourselves? People in Xiamen are curious about you. 6. You are famous in Xiamen now, if the government of Gulangyu islet invited you to visit Xiamen and Gulangyu islet, would you like to come? “We are delighted to hear that this discovery has sparked a response in China, we’d love to know more about the area. As you can see, the mystery message in a bottle is certainly an intriguing story that’s captured the interest of a lot of people. We really do hope to find who wrote it, but even if we don’t, we certainly have a story on our hands that we’re sure will influence our wildest daydreams for a long time to come. 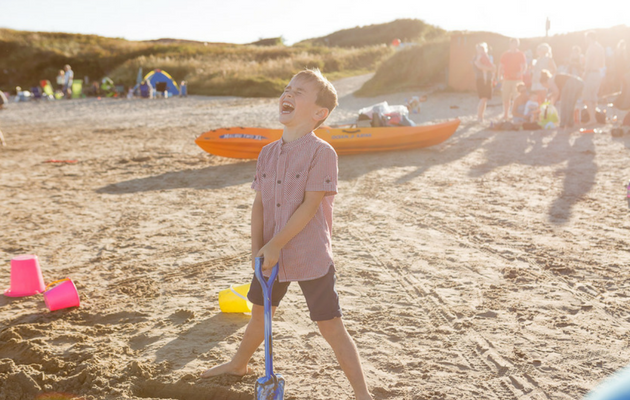 If you’re interested in finding out more about our beautiful holiday park, be sure to contact our friendly staff on 01407 860 111 with any questions or queries you may have. You can also follow us on Twitter to keep up to date with all the latest Silver Bay news, and you can also get a good look at our lodges online right here. It’s not very often that something strange washes up on Silver Bay beach. However, 2015 saw an eleven-year-old boy find something very unusual indeed during his holiday. Jack and his mother, Nancy, both Silver Bay residents, were out beachcombing with their beloved dog when they came across an intriguing glass bottle. Yet it was what was inside that encouraged them to find out more. The bottle was home to a strange message, and even more intriguing, it was written in Chinese. We were just generally wandering about with the dog, beach combing, and he found it at the back of the beach, near the sand dunes. Yet this simply added more questions rather than supplying any answers as to who sent this intriguing message, and how it came to wash up on the coastline of Anglesey. “Gulangyu islet is the most surprising, most memorable, and the place of both my happiest and saddest memories. At this unromantic and unremarkable islet, my romance that never stated, ended. Life must continue. The things you hold on to always hold you back. Keep moving forward, keep running. With all the things there are to think about, you will eventually forget. You need to be happy. Don’t get too skinny, don’t feel the need to change yourself. If you want to be a good person, there’s no need to change, as you’re already there. Wherever you may be, take time out to think in peace and quiet. Spend your days being happy with someone who is special to you. Gulangu Island is just of the coast of Amoy City, China, and it is also known as Xiamen City. Who will unveil nature’s mystery? Who will steer forth the ship of mercy? Lu Jiang deep and long, let us fill with love unbound. We also have further information about the bottle it arrived in, which is a traditional Chinese drink that’s available for sale in restaurants on the island, and is made from plum juice. We’ve had a lot of feedback from China surrounding this mysterious letter, but there’s one thing we still don’t know: who sent it. We will be sure to update this blog with any further information surrounding the strange message – and we hope to find the author soon! If you yourself were to write a message in a bottle, what would you put in it? Get in touch on Twitter and let us know your thoughts about your own message in a bottle idea, as well as this one!